This Grilling Season, Switch it Up with Turkey Cuts! May brings our first warm-weather long weekend (hopefully!) and that means that grilling season is here! Hot dogs. Burgers. Steak. It’s all pretty standard barbeque fair. But if you want something delicious, nutritious and definitely not “same old, same old”, go for turkey! Whether you’re hosting a patio party or just making a quick weeknight family dinner, grilled turkey is a super supper solution. Not only is turkey tops on the barbeque tasty metre, but it’s also incredibly versatile and nutritious. Win-win-win! New to turkey cuts on the grill? We’ve got you covered! The Canadian Turkey website has a whole section on scrumptious recipes for grilled turkey and a handy grilling guide for tips on barbecuing various turkey cuts. Here are three turkey cuts and three simple recipe ideas to help you get grilling! Turkey steaks are crosswise slices of the breast. They cook quickly and pair perfectly with any marinade. They make a terrific topper for a leafy green salad. My kids love them on a bun with grilled veggies for a better-than-burger experience. Grill it: Grilled Citrus Turkey Steaks are citrusy, slightly spicy, and mouth-wateringly good! Turkey talk: turkey breast is low in fat, and like all cuts of turkey, they are nutrient-rich, with a whole lot of nutrients, such as vitamin B12 and zinc and iron, in every bite! If you like the rich, moist flavour of dark turkey meat, you’ll love turkey thighs on the grill! Barbecued turkey thighs with a sweet and sticky sauce and a hint of smokiness are always a huge hit. Serve them with barbequed baked potatoes and a kale-filled crunchy coleslaw. Grill it: Grill a double batch of turkey thighs – the extras are excellent for a family style grilled turkey taco bar. Cook once, eat twice – my dinner dreams come true! Turkey talk: Although turkey thighs are moist, dark meat is actually lean. Having a backyard party? Impress your guests with a turkey drumstick! These big, juicy cuts are ideal for grilling; they take a little longer to cook than a turkey steak, but they are easy to cook and the end result is SO worth it! Grill it: Honey Garlic Brined Turkey Legs? Yes please! These drumsticks are meaty and mouth-wateringly good on the grill. 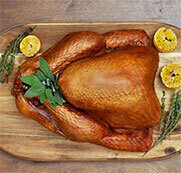 Turkey talk: dark meat is even richer in nutrients selenium, zinc, iron. Next time you fire up the grill, try turkey! Ask your butcher or grocery store about available cuts.